Author(s): Shaoli Zhu, Institute for Nanoscale Technology, Faculty of Science, University of Technology Sydney, P.O. Box: 123, Broadway, Sydney, Australia. Idriss Blakey, Hanhao Cheng, Kostya (Ken) Ostrikov. Background: The performance of plasmonic nanostructures is based on optical properties and the intensity of the electric field. The nature of the nearfields around coinage metal nanoparticles has been well-studied. However, how to project the enhanced electric field to several hundred nanometers distance might be more convenient for the real applications. Methods: In this paper, we examine whether an array of gold nano-stars may be used as enhancement of the electric field to the several hundred nanometers distance. Electron beam lithography was used to fabricate gold nano-star arrays. Near-field optical properties of these arrays were then obtained using near-field scanning optical microscopy (NSOM). The near-field optical properties were also explored with finite-difference time-domain (FDTD) simulations. Results: In the model, a scanning electron microscope image of actual nano-stars was used to build the FDTD targets of 40 nm thickness. The incident wavelength was 532 nm in both simulation and experiment. In the simulations the near-field optical intensity distribution was studied with monitors positioned at various distances (0, 1 and 2 μm above the top surface of a nano-star). The FDTD results were found to be consistent with the experimental NSOM results. Conclusion: We found that the field enhancement is not only localized to the individual nanostars but also projected several hundred nanometers into the space. 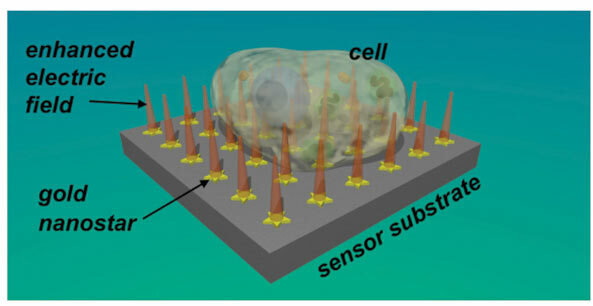 Such an array could be potential used to probe the intracellular environment of an adjacent cell or near-field imaging. Keywords: Finite-difference time-domain, nano-star, near field scanning, optical microscopy, optical properties, plasmonic. Affiliation:Institute for Nanoscale Technology, Faculty of Science, University of Technology Sydney, P.O. Box: 123, Broadway, Sydney, Australia. Keywords:Finite-difference time-domain, nano-star, near field scanning, optical microscopy, optical properties, plasmonic. Abstract:Background: The performance of plasmonic nanostructures is based on optical properties and the intensity of the electric field. The nature of the nearfields around coinage metal nanoparticles has been well-studied. However, how to project the enhanced electric field to several hundred nanometers distance might be more convenient for the real applications.